Walter T. Lemiski, M.A. B.Ed. B.Mus. 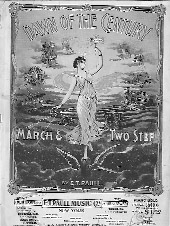 A caption from an early sheet music cover reads, "Try this over on your piano." I must have taken that advice to heart since way back when, as a lad, I enjoyed rifling through piano benches of my folks, relatives and friends. It was there that I first discovered the astounding variety of popular music from days gone by. The piano in the front parlour was the entertainment unit of an earlier age. With no radio, no television, no stereo, and good heavens - think of it -- no internet for entertainment, one was obliged to make one's own music. 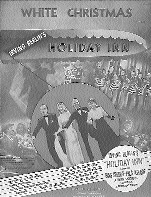 Sheet music gave the purchaser the very latest of popular hit tunes, novelty songs or patriotic anthems. Some collectors, myself included, get a thrill from learning and performing the many oh so melodious selections. They just plain don't write tunes like those any more! As well, a wide range of emotions (many unabashedly of the heart-on-the-sleeve variety) that are virtually unknown in current popular music are thoroughly mined in turn-of-the-century song -- from the pathetic to the humourous, from the sentimental to the maudlin. Emotions that we have discarded or disdain today were a more common expression of that earlier day. One does not have to be a musician or even a wee bit musical to enjoy sheet music. Collecting sheet music is like saving a slice of social history. The vast range of human endeavour of the time is examined in all a sundry manner. As more than one writer has noted, every story is inevitably about love. In the case of sheet music, standard expressions of love were for a young lass, for the old gang, or for one's silver-haired mother. Sheet music was in some instances for the earlier ages what the stand-up comedians are for us today. The composers were often distinctly irreverent, yet they would uncannily hone in on the absurdities of the day with deft accuracy. Patriotism, hair styles, new inventions such as the telephone, airplane or rolling chair were all fodder for the song writers. Many of the covers display only a slim measure of artistic merit. This is understandable since these were in fact throw away items reflecting the latest popular fads. Therefore, the music sheets were likely to be used well for a short time then carelessly discarded. On the flip side, one can find sheet music by such noted artists as Norman Rockwell, Harrison Fisher, Albert Barbelle, and F. Earl Christy. The aesthetic value of sheet music covers by these and other such gifted artists is admired and treasured by many a collector. Will You Leave the Highlands Lassie, 1883. Collecting sheet music by categories is a wise idea, in part to provide a focus for the collection, and to keep one from being totally buried under a mountain of music. Some folks gather pieces by one specific composer or performer such as Eddie Cantor, Stephen Foster, Scott Joplin, Shirley Temple, Bing Crosby or Irving Berlin. (We have a wall in our home on which we hang our favourite Irving Berlin songs, which in jest I have dubbed our "Berlin Wall"!) Others collect by cover artist or by one of a myriad of subjects that often dovetail with collections of other memorabilia, such as blues, comedy, deco, Disney, Dixie, fashion, Indian, Irish, ragtime, the World Wars, sports or transportation. The evolution of printing methods can be surveyed through studying sheet music. The earliest printing technique that is of interest to our subject, from around 1800, is called "engraving". 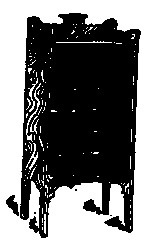 This method necessitated the whole image and wording in reverse on a metallic plate, usually copper. Later more durable steel engraving was adopted which provided a longer run life for the plates. Copperplate metal engraving was a calligraphic style of script and flourishes often seen on music covers from around 1800 to 1860. As well, many superb decorative pictorial representations and elaborate letterings were captured on sheet music covers from this period. Any colour was laboriously and expensively added by hand. In the 1860's printing was revolutionized by the introduction of chromolithography. This system required many different printing stones, one for each different colour. Fifteen to twenty different colours for one image was not unusual. The printing stones were much more durable than the earlier copper plates and could run in the order of 5,000 prints per set. It is hard for us to imagine a world accustomed to seeing almost all printed materials merely in black and white. Modern colour printing systems use only four basic inks to recreate the spectrum - red, blue, yellow and black. Matched up to the textural depth of chromolithography the four colour system appears somewhat flat in comparison. One of the easiest, and generally most reliable ways of ascertaining the age of sheet music is by its dimensions. The size of the earlier, pre-1920, sheet music was approximately 10 inches by 14 inches. Post-1920 saw a shrinkage in size, to 9 inches by 12 inches, which continues to be the standard right up to the present. Toward the end of the First World War various companies adopted the war movement's conservationist spirit. In a shrewd marketing ploy they introduced smaller half-sized war editions of their sheet music, 7 inches by 10 inches. The Leo. Feist Company of New York proudly trumpeted their patriotism on the front of their new releases: "To Co-operate with the Government and to conserve paper during the War, this song is issued in a smaller size than usual. Your co-operation will be very much appreciated." Translated = Be patriotic and buy our music! The introduction of new copyright conventions at the turn of this century make the dating of music from then onwards an easy task. Almost invariably the copyright date and other pertinent details are found at the bottom of the first page of printed music. Earlier sheet music is however a trickier matter to deal with. To date pre-1900 sheet music often one must look at the type of printing utilized, the artistic style of the cover, the composer's lifespan, the years in which the publisher did business, and the subject matter. With a little research much early sheet music can be quite accurately dated. 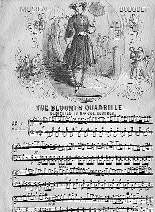 For instance, the undated piece entitled "The Bloomer Quadrille" was published by Charles Sheard and Company in their series "Musical Bouquet". Sheard's company was established in 1846. The piece was dedicated to the pioneering American feminist Mrs. Col. (Amelia) Bloomer in recognition of her introduction of a new dress style in the year 1850. Her invention, Bloomers, consist of a short skirt and loose trousers that are gathered at the ankles. The "Bloomer Quadrille" can be safely dated to the early 1850's. Bloomers were advocated by women's rights groups in the belief that a corseted body meant a corseted mind. With sheet music, as with most paper collectibles, the condition of the specimen is of paramount concern. Pre-1920 music was simply not intended for life in a piano bench. With the narrow width of most benches even newer sheet music can take quite a beating. Of course, any tears, folds, missing pages, music shop stamps, or writing on the sheet music will usually diminish the value of the piece greatly. In vogue prior to 1920, specially designed sheet music cabinets with generous dimensions were perfect for the large music sheets. The cabinet, with either a swing door or a curtained front usually had a half dozen shelves that could comfortably accommodate a couple of hundred scores. These wooden cabinets were frequently were made of oak or birch and often finished to imitate mahogany. A small mirror sometimes would set off the back of the cabinet. The industrial revolution did little to help the longevity of sheet music. The earliest paper used in sheet music was made using a high percentage of rag. These high-rag-content sheets can be cleaned by use of an art gum eraser or by careful blotting or soaking. However, the later pulp-based papers should usually not be cleaned since they will often-times disintegrate. For those cherished pieces of sheet music in a collector's possession a couple of options exist. For the most prized pieces professional framing with acid-free matte is the ultimate. For the moderate favourites "frameless" frames work rather well. The simple design of these relatively inexpensive frames consists of a hard-board backing onto which is clipped a sheet of glass. The great plus with this system is that it is a snap to change the sheet music, so one can enjoy a constant rotation of favourite pieces on display. Storage of sheet music should be in moisture-proof storage containers. Flat storage is best for the sheets so that they do not bend or crease under their own weight. For a small investment one can purchase plastic sleeves to maintain the crispness of the better sheets and to keep away potentially harmful dust, moisture and fingers, while still allowing for pleasurable viewing. Cardboard inserts assist in providing a little added support when using plastic sleeves. If one possesses a musical family an initial starting place in searching for sheet music treasure would be the piano bench or attic. Antique stores, flea markets, and antiquarian book dealers also provide hit and miss sources for sheet music. Indoor antique shows can if one is persistent be fruitful sources, however many dealers dislike carting around paper goods since they can be fragile and liable to suffer damage in transit. Outdoor shows are even slimmer hunting grounds with the chance of inclement weather keeping a lot of paper items back at the dealer's shop or home. In these parts local auctioneers occasionally feature some small lots of sheet music. If one has the patience and good luck to stumble across a bundle of music some gems just may be found. Specialty sales of sheet music are more frequently held in England or the United States. Clubs for the preservation of sheet music are also, alas, more prevalent south of the border, but like-minded sheet music aficiandos do lurk around our more northern climes. For the technophiles out there, the internet offers various possible sources of sheet music. One can either link up with other collectors or participate in auctions on the world wide web. A fine collection of sheet music can be put together for a relatively small outlay. The vast majority of sheet music available is priced at under $10 a sheet, with many pieces being available for only a couple of dollars each. Today's collectors may reasonably have a chance at finding plenty of sheet music from the 1930's onwards, a fair amount from 1900 to 1930, and a much lesser amount from 1800 to 1899. Often, the only pre-1900 music that can be found is in bound volumes. Although it is delightful to find a century-old treasure trove of music, frequently the sheets were trimmed down to fit into a uniform format prior to binding. 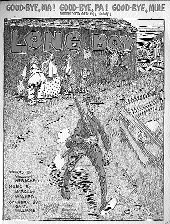 Thus we often lose bits of the titles or worse yet portions of the magnificent lithography. Like so many fields of collecting, serendipity plays a large part in gathering sheet music. One just never knows what precious musical leaves from an antique album are lying just around the next corner. For the great amount of pleasure to be found in an early sheet music collection the hunt is certainly worth the effort.